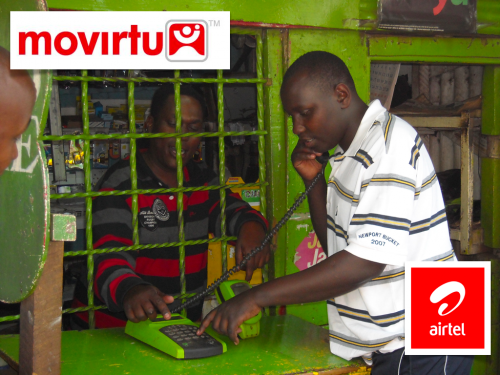 Vodafone recently concluded a policy paper on “Broadband in Emerging Markets”, also titled “Making Broadband Accessible for All“. The position and reason for this paper is best summarized below. Traditional definitions of broadband have a narrow focus on bandwidth and speed. This paper uses a wider definition, as broadband policy needs to consider the entire â€˜eco-systemâ€™ of internet and data services from both a demand and supply-side perspective. Mobile web content is growing at an astounding rate. It rose 2.6-fold in 2010, nearly tripling for the third year in a row. Official Kenyan industry statistics show that mobile internet subscribers will grow by approximately 843% for the 12 months to September 2011. What I like about papers like this is that I get to use words that normal people don’t use. I make a case for international content and platforms as “drivers of diffusion” of data across East Africa. That simply means that these platforms and content are helping to spread the use of data more deeply into the region, and allowing local players to get in at lower costs. The reasons are that international platforms, such as Facebook, Yahoo!, BBC, CNN, Google and Wikipedia, have already been tailored to work on the most widely used data- enabled handsets. This contrasts with local content providers, many of whom have yet to tailor their websites for mobile access. In addition, local content less available at present, not as easy to license, and often cannot be reliably guaranteed as a long-term source. I interviewed a number of executives from Kenya, Uganda and Tanzania. There was a clear belief that while international content, increasingly localized for the market, is currently king, local content has the greatest growth potential because it is more highly valued by consumers. While local content developers lack scale they have advantages that the global platforms do not. For one, they understand the local tastes and culture so customers value their content more. The consumer benefits of truly local content and platforms could be large. There is still a lack of concrete government policies for government services or content to be made available or accessible via the mobile in any country in East Africa, even though this is the primary channel by which citizens could access services online. There is a solid case to be made for mGovernment, instead of just eGovernment. To underline this, the most popular Kenyan Government website (Kenyan Revenue Authority) is shown as seen on a PC screen, a smartphone (HTC Desire) and a typical 2G internet enabled handset (Vodafone 350). The website is most clear and easily accessible via a PC interface (and consumer interaction primarily is through downloadable pdf files). There are no browsing problems when accessing through a PC-based browser. 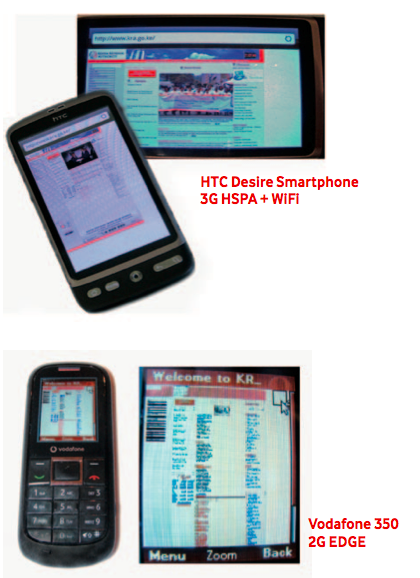 The KRA website is also accessible via the native Android browser in the HTC Desire Smartphone. The HTC Desire also allows downloading and viewing of pdf files. However, the native browser on the Vodafone 350 (a basic 2G EDGE handset) does not present the KRA website in a usable format. As can be seen, the website is badly rendered and quite impossible to navigate. An argument can be made that m-government services would have a greater impact if the focus were on supplying tools for small businesses to interact with government, rather than only making services available for citizens in general. By removing the barriers to entry for small businesses, the government would be providing a service that increased usage, decreased business costs and had a potential tax revenue increasing effect due to filing and paying on time. 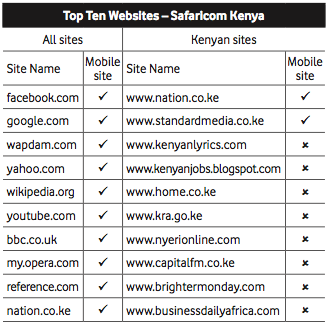 East Africans are accessing the web primarily through their mobile phones. The new medium is enticing them online with the new services and content provided through a new medium. Broadband penetration rates are low enough in this region that we are not yet seeing the displacement of newspapers, radio and TV seen in other, more connected regions of the world. However, as with all network technologies, there is the potential for reaching a tipping point. This will depend on the provision of enough mobile web content that is valued by East African consumers. The content driving East African users online is currently largely provided by international news and content sources, such as Yahoo! and the BBC, and also by global internet platforms, such as Facebook and Googleâ€™s Gmail. Even taking into account the decreasing data costs, falling data-enabled handset costs, and the increased availability of broadband, there would not be enough traction locally to get to the critical point if the content were not available. clear leading content providers. At present the key trend is the provision of increasingly localized content by the leading global companies. This paper has identified two important barriers to the further diffusion of mobile internet usage across East Africa: lack of m-government policies; and, more important, an absence of charging mechanisms which share the cost of mobile internet access between end-users and content providers. If governments embraced mobile-based provision of services and provided access free of usage charges to end-users (sharing the efficiency gains through payments to network operators), the potential impact on internet access could be dramatic. The challenge for governments and local developers of mobile web content is to utilize their local cultural understanding and ability to maneuver quickly to make their content more relevant and affordable to end-users. 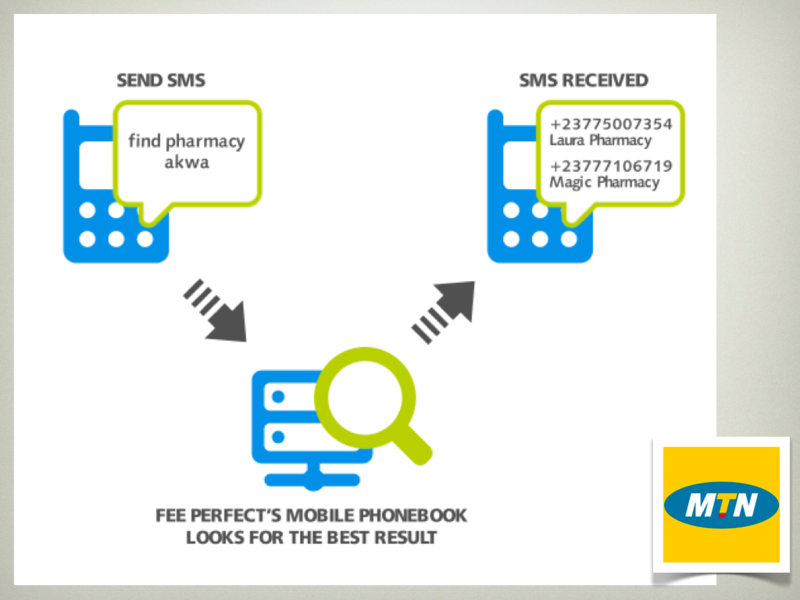 Possibly MJ’s (how he’s known in local Kenyan parlance) greatest business move was also a measured risk, that is being the company to take a software created by parent Vodafone Group and push it into the market.Â That software: Mpesa, the most successful mobile payments system in the world.Â Safaricom has more transactions each day than Western Union does globally in a year.Â Yes, it’s that impressive. No one in the world holds as much knowledge on how to deploy a mobile money system, nor how to grow it and operate it as Michael Joseph.Â However, all of his success was penned in by the fact that Safaricom only serves Kenya, he could never grow it outside of the country in a meaningful way.Â Forays into Tanzania and South Africa have happened, but aren’t seeing nearly the success as in Kenya. Second, no one else could take this brand global and have the ability to stand toe-to-toe with other operator peers around the world like MJ could.Â It needs that type of personality if it’s to do what’s next. 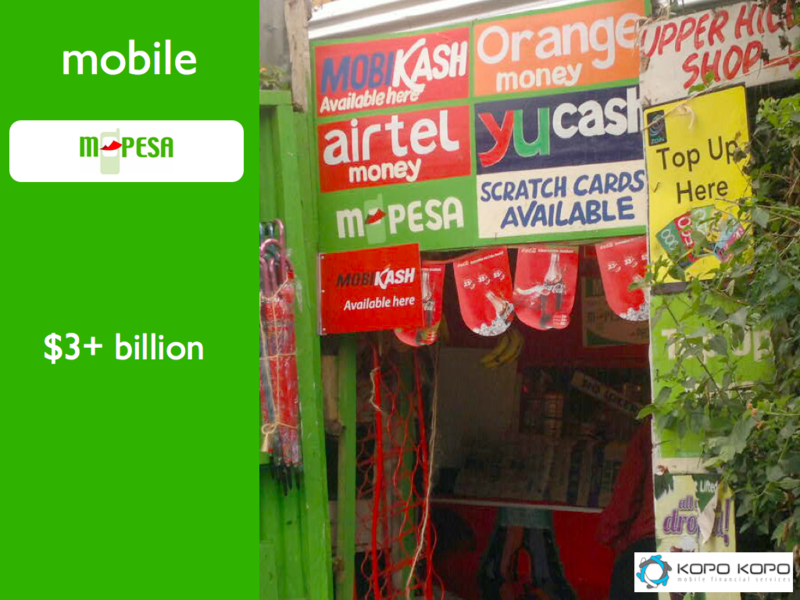 Third, there aren’t many opportunities that crop up that allows you to take on massively profitable and embedded incumbents and win.Â In this case, that’s all of the other payment methods, including credit cards and internet payment platforms.Â Mpesa could become the defacto mobile payment system for the world – displacing other methods. That’s how it looks from where I sit, if you know more, add it below. This is brilliant. Legends of Echo is a new free Java mobile phone, massively multiplayer role playing, location based game put out by the people behind the Grid in South Africa (Vodacom). The best overviews are found on the News24 Games blog, in an interview with co-creator Nic Haralambous, and on Nic’s own blog (you’ll also want to read what Vincent Maher had to say about it). From what I can tell, without having played it yet, is that it’s a turn-based card-type game. You find loot, do battle and win more loot. Leveling is there, but it’s not as large of a component as expected. On top of the normal game elements, and an indicator that makes me believe that LoE might be better thought-out than most other games, is the fact that they built an economic system into the game from the beginning. Nic states, “There is a currency model built in to the game that allows players to spend airtime in the Echo Marketplace.” That’s a big deal, and it’s not easy to pull off if done right. Legend of Echo’s graphics and visual appeal can’t be understated. They spent a good deal of time to make this game look and feel like a World of Warcraft competitor, and it shows. Visually it reminds me of Arcanum meets World of Warcraft. You’ll need to have a high-end Nokia or Sony Ericsson to play Legends of Echo. I’ve got an old Nokia N95 sitting around somewhere, so my plan is to dust that off and give the game a run when I’m in Cape Town next month. It also appears that you actually have to be in South Africa to play it, but I’m checking with Nic to see if anyone living in a country that The Grid operates in can play it as well. This is doubtful, as it’s based also on the Afrigis system, which is fairly Southern-Africa specific. Legends of Echo from Cow Africa on Vimeo. It seems that a web-based Java version of this game would be successful, if only because it would allow you to play on whichever device you have handy. Are there any plans for that? How much will LoE go the direction of Foursquare where they really use the location based systems to drive competition and increased game play? I’m impressed that they took the time to create a strong virtual economy. Will a real-world economy of people using real money to buy and sell goods develop online, as we’ve seen in other successful MMO games? You’re supposedly able to “Build special items with unique abilities”. I’d like to know more about the crafting system, as that can be one of the best ways to deepen interaction and make a game more unique.